Emmy-award winner Bob Einstein reprises his role as Stuntman Extraordinaire, Super Dave Osborne in a four-part Spike TV event produced by Camouflage Films. 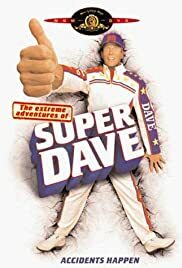 Super Dave never had a movie because he's only funny in short doses and this movie proves that. There should have been more stunts and less talking. While it's not a laugh riot, it is a decent movie. Give it a chance.